For cycling fans there are some exceptional routes in a network of quiet dirt and country roads and small roads, which cover the entire island. The coastal road along the south western shores, from Agia Anna to Kastraki, is a good choice, while for the bolder cyclists, there is the route from Sangri to Agiassos. 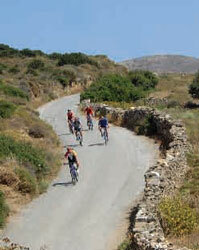 There are some wonderful routes in the mountain areas of Naxos for those who want to stretch them­selves to the limit. You can also take part in organized cycling tours, for which you must not have all the necessary equipment.